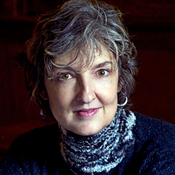 Listening to Barbara Kingsolver talk about Animal, Vegetable, Mineral. Confession: When John and I ate at the Harvest Table outside Abingdon (in our family, we call this The Barbara Kingsolver restaurant), we actually saw her and her husband. Sigh.